This is not my first blog post on this topic and will likely not be my last, but the narrative has officially gone too far. It is time to change the name of the Washington Redskins. Two posts gained broad attention in the past 24 hours and neither of them are the types of stories that Washington should be promoting or that fans should be dealing with. The first was what appeared to be a 50-year celebration photo of the Washington Cheerleaders. In poor taste, the costumes ranged from the more common style of cheerleader uniforms we see today to dressing up in stereotypical clothing representing Native Americans. When the cheerleaders were first introduced to the team in the 1960s, the stereotypical costume was something that barely attracted any negative attention. Interestingly when considering that this was during the time of civil rights, Washington ran with the cheerleader uniforms until sometime during the 1970s. There was a fringe element that was maintained over the next couple variations, but this style of uniform would never be accepted by the public with today’s social climate. In comparison to other challenges with the team image, this falls more toward the poor taste side of the continuum compared to the outright offensive. The second article came straight from the organization’s playbook. With pressures coming from 50 US senators and countless other groups, there was bound to eventually be a more marquee supporter outside of the Washington organization. Enter Democratic Virginia senator Chap Petersen. Leading the charge, he has developed the group Redskins Pride Caucus, aimed at defending the use of the name and images. Claiming the representations as “symbol[s] of unity,” he blasted the recent climate as socialist and the attacks on the team as unjust. The article seemed to be missing one very important element…actual discussion of the name. As much as they talked about wanting to defend it, there was no defense provided for the term’s actual meaning. Outside of these two recent posts, there are plenty of other discussions, videos, and blogs highlighting the issue. The ones that demand a change are more direct and poignant about why the name is offensive, citing definitions and historical use of the term. There is some flaws with these posts, at the same time. One of the things that Washington has been able to do relatively effectively is craft a narrative where Native American support is strong and a large majority of surveyed Native Americans have supported the continued use of the name. ESPN’s First Take took on this debate, where Stephen A. Smith discussed this challenge and how his resistance to the continued use of the name was fading in light of the strong documented/reported support from Native American representatives and with consideration of the early history of the team. The team was the Boston Braves for the first year and turned into the Boston Redskins, with 4 players identifying as Native American. Because the team has maintained the Redskins name for the vast majority of their history and with Native Americans associated with the organization, there are elements of a case for their name support. But then you have to think about the definition of the word and the potential true impact of the name publicly. While many supporters of the name abhor the idea of going to the encyclopedia definition, the Oxford English Dictionary defines the term as American Indian (dated or offensive). The definition continues to discuss that there were three variations of the name (redskin, Red Man, and Red Indian), none of which are positive or remained neutral. The first two were originally used to distinguish the native peoples living in North America and their affinity for using face paint, but the terms eventually were used in a disparaging fashion. The final one was more of a British term but quickly turned negative in line with the other challenging terms used in the US. There are records that highlight the use of the term in treaty negotiations during the early centuries of the US and would support a more accepted use of the term, but more examples exist of the negative representation of Native Americans with Redskins as a slur in printed announcements that document the hunting and killing of the population during the 19th and 20th centuries. Some references actually attributed the term to the scalping of Native Americans in the collection of bounties. Persecution and discrimination tend to be intertwined with the narrative of the term’s history. During the history of the team, the term has more broadly been considered a racial slur but was used to distinguish between the Boston Braves baseball and football teams. When the team moved to Washington, the Redskins label followed it. Throughout the team’s early history, there are few records that highlight public attention to the term, but that started to change around the Civil Rights movement. There have been judicial battles, conflicts between students and school administrators, and discussions in the public forum over the past 40+ years. High schools and colleges have mostly moved away from the use of the name and some courts have banned the use of derogatory terms, including the term Redskins. Meanwhile, Washington has refused to make the same change because of their commitment to the tradition and the blinders-crafted story of the honor and pride behind it. How many people (or what percentage of the population) of Native American heritage have to be offended for the change to occur? Because the likelihood of the change will be determined by the economic impact during the social and political battle, is this the only way to make change or is there a preponderance of evidence that would overrule the economic impact? Would the NFL owners ever step up the way the NBA did in the Donald Sterling situation to put the issue to a vote? I do not have the answers, but there is something else that I do believe could be a difference-maker. The news about the team over the past 2 decades has not been that great with regards to the performance. Since 1992, the team has been to the playoffs only 4 times. They have only won the division twice in that timeframe. In addition, there have been 8 different coaches, not including Jay Gruden and 21 different starting quarterbacks. In the past 10 years, the offense and defense has fallen below the league average more than above. RGIII has provided some excitement, but the overall optimism levels have diminished and are tempered until tangible proof reveals itself. Fans are loyal enough, but performance needs to improve soon before…the only narrative about the team is the name controversy. One of the possible consequences of this situation is that regardless of the performance, the team may be hammered in the media about the name from both sides. When the team played against the Minnesota Vikings in 2013, a protest of hundreds of people took place on the Thursday prior to the game. This was not the first and it certainly will not be the last. If the team does well and goes to the playoffs again, more protests like this could continue to sprout up. 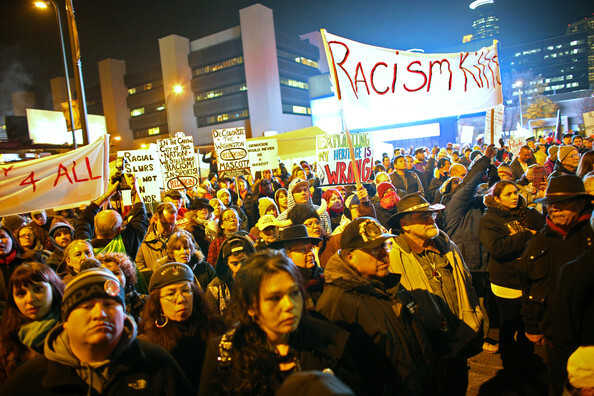 Many of the protestors are not of Native America heritage, but the vast majority in the protests are. If this is not enough to get attention, the team is in for more and more turmoil for its foreseeable future. Performance will take a backseat, as it has during this offseason, to the continued outrage over the stubbornness of an owner and organization. I want to finish this post by stating that I am a huge supporter of the team (minus the name) and will continue to support them. The history and the future of this team does not need to be blanketed by a poor decision back when the franchise was formed and we have an opportunity to return the conversation about the team back to football. I am almost to the point that I don’t even care if the name ends up being something off-the-wall ridiculous with no actual ties to the nation’s capital or surrounding area, as long as it abandons the continuation of racists themes. Change the name, change the narrative. It is that simple.